To all those who bemoan today’s world—adventure all gone, everything already discovered—I’d say: Let them take a voyage through Indonesia. According to CIA records, the area includes 17,508 islands. During the second year of circumnavigation, Whale Song’s three-month stay just whetted the appetite for more. To all those who bemoan today’s world—adventure all gone, everything already discovered—I’d say: Let them take a voyage through Indonesia. The country spans 46 degrees of longitude from Irian Jaya (West Papua, New Guinea) to the northwestern tip of Sumatra, and everything between 10°55S and 05º26N. According to CIA records, the area includes 17,508 islands. During the second year of circumnavigation, Whale Song’s three-month stay just whetted the appetite for more. Wailing mosques and traffic fumes took over the airways as soon as the anchor chain stopped rattling down. Our motoryacht Whale Song had reached Jayapura, our first harbor in Irian Jaya. The Indonesians renamed this western part of New Guinea Island when they took if over after the Dutch. 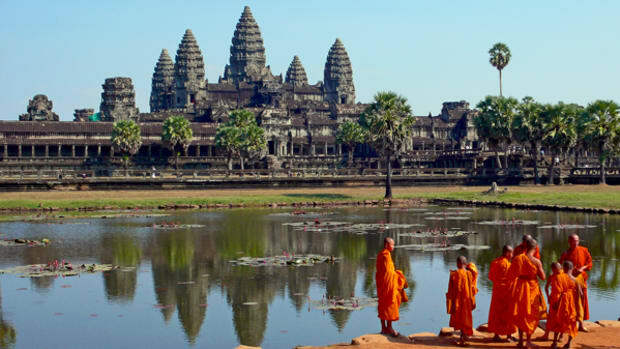 It’s a busy military outpost—mostly Javanese bureaucrats and immigrants populate the city. Buzzing boat traffic crosses the bay and dozens of “bagans,” squid-fishing trimarans, bob outside the harbor like giant water spiders. Though unattractive, Jayapura offers the connection to the Papuan tribes in the interior. We tossed a coin and I had to stay with the boat anchored in a harbor lined with plastic garbage—uncertain holding. 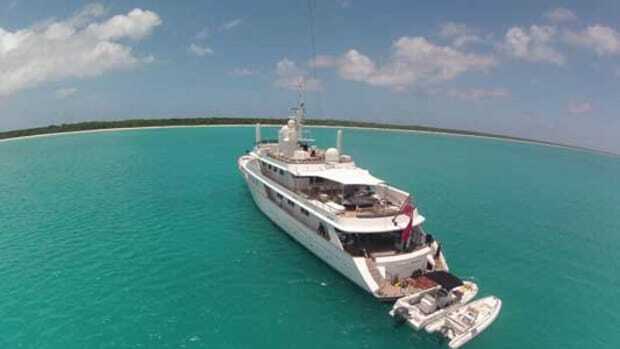 The yacht’s owner, Grant Wilson, flew with friends and some of the crew to Wamena and the Baliem Valley. There they saw the real Papuans, the Dani men. They wage traditional battles naked but for gourds held by thin strings around their waists, just as Peter Matthiessen described them in “Under the Mountain Wall,” published in 1962. This time, the spears and arrows drew no blood—the age of tourists, though only few show up, has arrived. My wife, Nancy, the yacht’s mate, recorded singing women, clad only in grass skirts belted below the waist. Pulau Kri, highlighted by National Geographic’s David Doubilet’s spectacular underwater images, gave us the first glimpse of Indonesia’s reef riches. The lightning-speed strike of a shark on a hapless grunt was an exciting extra. The Kri resort people arranged a trip to a lek, a mating ritual during which male birds of paradise dance for their potential mates. Heavy raindrops fell on faces turned up to look up at the trees. Despite birdcalls resounding in the foliage, no bird of paradise showed—they hate getting wet, explained the naturalists. Our paradise bird chase continued in Kaboei village at the west end of Waigeo Island but, you guessed it, it rained again and birds of paradise don’t dance in the rain. But there is so much to see under the waves that our compressor and scuba tanks worked overtime. Around the east end of Pulau Misool, in passages between islets, the underwater scenery is dramatic, with structures of corals sprouting from rock cathedrals. Soft corals, pliable and gaudy, wave in the current where shoals of fish flutter. These underwater wonders continued in the Komodo Islands with the addition of a few manta rays banking through the blizzards of plankton. Fortunately, the infamous, big and very carnivorous Komodo dragons don’t dive. But they swim. Sitting in the dinghy at dawn off Rinja Island, we snapped photos of a dragon foraging along the shore. Five boat lengths away, his forked tongue wiggled, saliva oozing—the beast was trying to taste us. And then he marched into the sea toward us. The good old Yamaha had not run that fast in years. Dynamiting reefs to get fish has destroyed quite a bit of coral around Indonesia. Sea turtles also are threatened. The small fishing boats that came along to sell their catch always had turtles in the bilge. So it was a treat to dive with turtles around Banda Islands’ healthy reefs. Banda, the fabled Spice Islands of the Moluccas, thrive now on low-key tourism and subsistence fisheries. Banda Neira’s landlocked harbor dozes calmly under a hill topped with a Dutch fortress from 1611 on one side and Gunung Api, a 2,000-foot volcano, on the other. A pastel waterfront is the gateway to a town of smiling people—quite a change from the early 2000s when bloody violence between Muslims and Christians in Ambon on Pulau Seram spilled south to Banda. Navigation got simpler south of Banda Neira; as the cone of the last volcano shrank astern, another began to rise over the bow. On some, small villages cling to steep hills, their peaks often smoking. As we swung west, the islands rose up to 6,000 feet, their populations tilling soil enriched by volcanic ashes. All these islands float on a very unstable crust; volcanic eruption is always a threat. Or monstrous waves. Or both. Hengki Kolit, our translator, guide and crew, lives in Maumere, on Flores, fortunately on high ground across the massive mound of volcano Rokatenda. 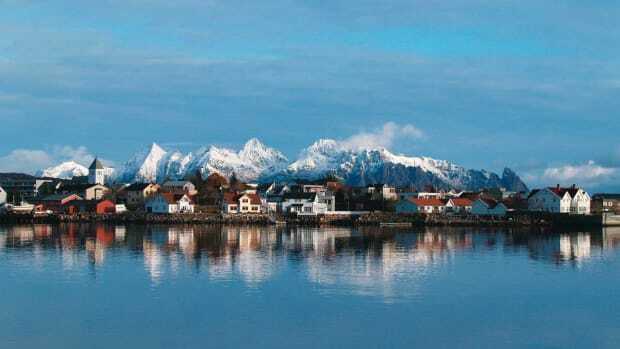 In 1992, the earth shook, the sea bottom heaved, and a tsunami erased the costal villages below. Thousands died, though fewer than in the 2004 disaster that swept through the western Indian Ocean. 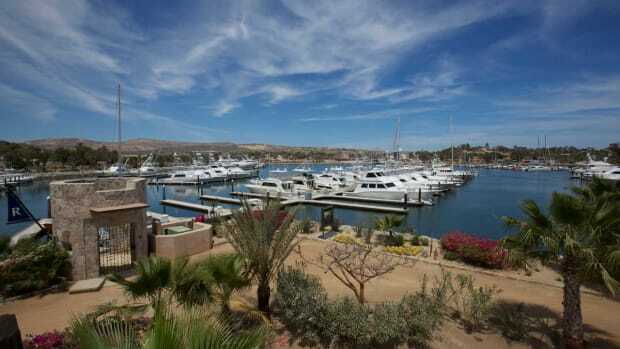 Around Maumere, waterfront real estate still sells cheap. The Indonesian empire includes Kalimantan, the part of Borneo under Jakarta’s rule. Yachts stop on Kumai River near Tanjung Puting National Park. Its fame began with Camp Leakey, a primate research station in the midst of a large wild orangutan population. Tourists come to see these “men of the forest”—orang utan—in Bahasa, Indonesia. Watching the apes taking stealthy looks at homo sapiens, you might think they reciprocate the interest. The riverine jungles here teem with other wildlife: proboscis monkeys in troops, gibbons breaststroking across waters, and the hornbills cruise the morning sky as your little boat putt-putts from the main river to Camp Leakey. The anchorage on Kumai River had great protection, good holding in mud and atypically moderate depths. 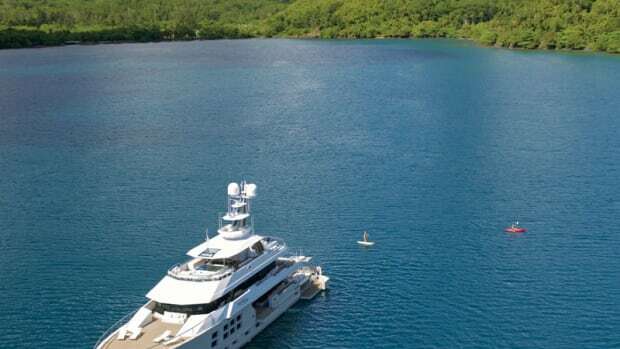 Off most Indonesian Islands, yachts must anchor 75 to 120 feet down, often very close to fringing reefs, in places safe only in the calm weather that prevailed during our February, March and April voyage. And forget tying up. Commercial ports are rough and polluted. 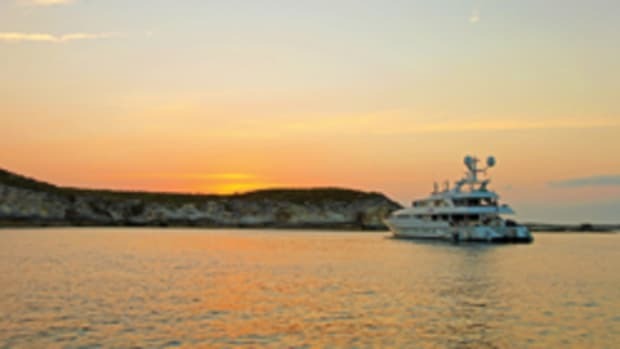 The only safe facility for yachts we used is in Benoa Harbor on Bali, an exciting island. The Ubud area with ancient Hindu temples, traditional dances and talented craftsmen helped us forget the throngs of tourists and suicidal motorbike traffic. Then we cruised along Bali’s east coast. Tourists vanished; gravel and black grit replaced sand. Long-legged sailing trimarans straddled every flat piece of shore. At dawn, hundreds of them launched into fish-rich seas. Indonesia is oil rich, and subsidized fuel for Indonesian shipping has nearly removed larger sails from the horizons. Only a few of the grand (up to 150 feet) phinisi of the Bugis people from Sulawesi still carry auxiliary sail. But the surprises continued. We followed the south shores of Pulau Lembata in ashen haze. Two volcanoes, larger than 3,000 feet each, were spilling smoke, their bare sulphuric hillsides steaming. Our course went over charted islets, their remains now gone due to tectonic subsidence. A little farther, steep green hills descended toward a village, its houses lined up on hand-carved terraces. On the beach below, rows of wooden bows pointed at the sea from under thatched shelters. The boats, 30 to 40 feet long, had their woven-mat sails neatly folded on the spars. A lot of gear in them reminded me of the Whaling Museum on Nantucket. Even those double-ended hulls were similar. But, of course, this, Lamahera, was a whaling village. Stone steps lead through the arch of a Christian chapel to the village, quiet in the off-season when the whales are gone. Over fences made of whalebone and ribs I could see women weaving. They offered for sale the finished ikats, patterned fabric celebrated among folk-art experts. From up the road came the sound of banging. Four shipwrights with adzes were hewing slabs of timber into notched planks; next to them, two elderly men chiseled wooden pegs for plank fasteners. The life in this costal village is the same as when the world population numbered in millions instead of billions. It wasn’t undiscovered, but to me it was worth a voyage of thousands of miles to be there. ❱❱ WEATHER – WINDS. 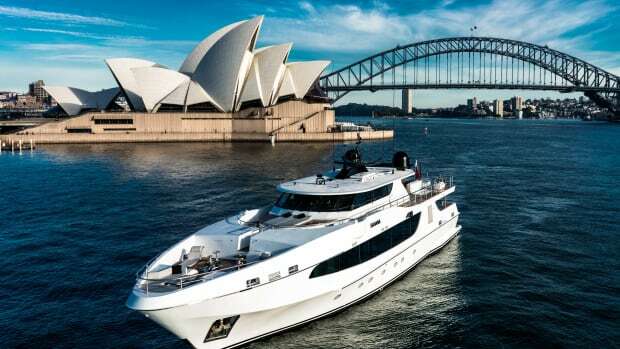 Normally, circumnavigating yachts enter Indonesia from the east. Local charter-boat weather lore reveals that strong westerlies blow from January into April, starting in Komodo Islands and continuing westward. 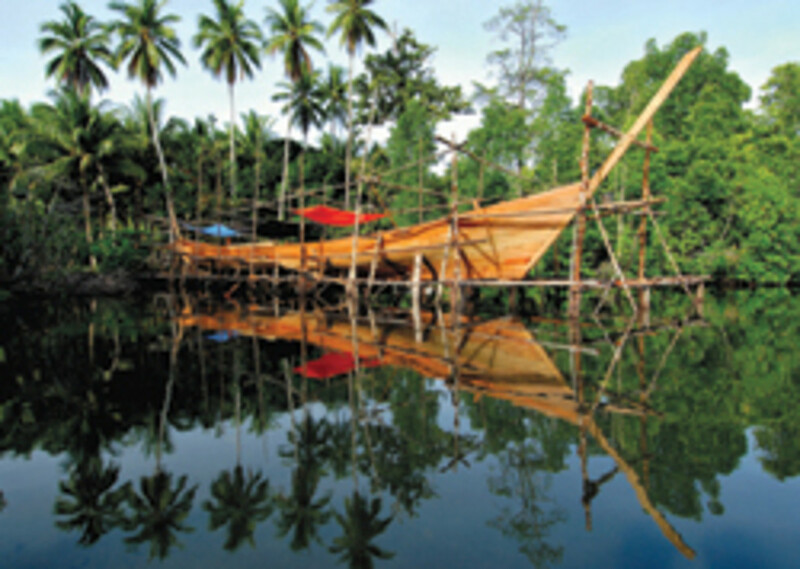 Established charter boats will then work northeast from there around Raja Ampat and Sorong, Irian Jaya. Yet, we spent February and well into April in the supposed area of bad weather associated with the west winds and encountered only variable winds and calms. ❱❱ PAPERWORK. It can be intimidating. 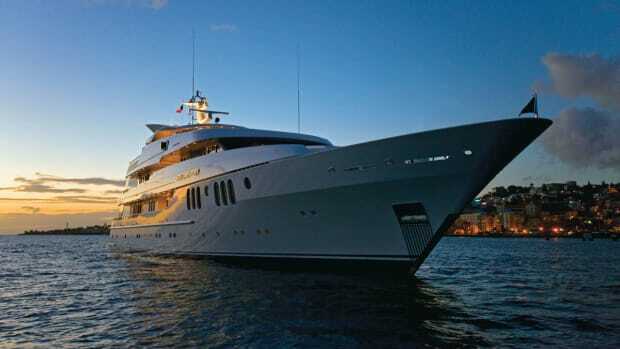 Yachts that plan to spend extended time in Indonesia need to obtain a cruising permit and visas. Contact Indonusa Segara Marine at headoff@insonusamrn.co.id for assistance. You should ask for Ms. Kumala Dewi or Mr. Stephanus S. Djajasaputra. Fax +62 361-722236. Tel +62 361 710004. We found them reliable and efficient. Still, to be safe, start paperwork about two months before a planned arrival in Indonesia. The Indonusa people have the right contacts and know the latest regulations. They can also supply live-aboard translators, if required. ❱❱ CHARTERS. 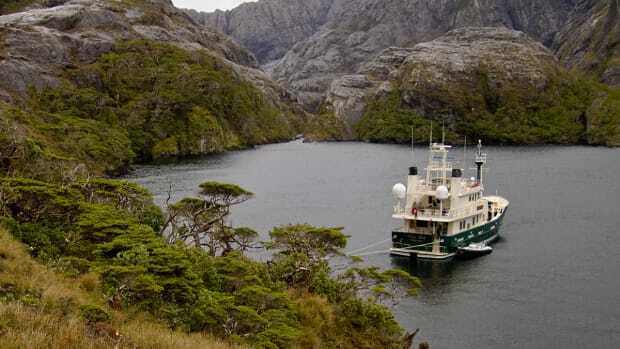 Several large vessels, most locally built, do live-aboard diving expeditions to prime locations. Other operations cater to sportfishermen or even helicopter junkets. Again, Indonusa Marine (above) keeps track of their quality and availability and also acts as a booking agent.